"From space, the planet is blue. From space, the planet is the territory, not of humans, but of the whale". Thus begins Sarah Brightman's CD Dive, and it's a pretty fitting way to capture the spirit and message in Oceans, the newest DisneyNature documentary. Following up the success of Earth, the filmmakers dived (pun slightly intended) into the waters of our planet, creating a film both beautiful and pleading. We start with a group of children running to the sea, and narrator Pierce Brosnan asking the philosophical question, "What IS the ocean?" That is the starting point to an extraordinary journey into the depths of our home and to encounter the denizens of the seas both familiar and exotic. There is the blanket octopus, who appears to almost have wings that float majestically under the waves. We get the stone fish, a relatively unattractive creature who lives up to his name in looks. 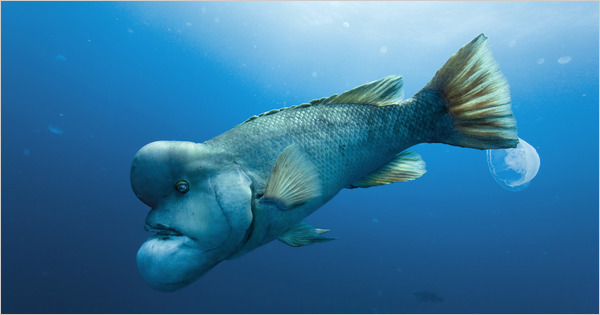 There is even a creature called the Asian sheep's head fish, which looked like The Elephant Man to me. In its 86 minutes we get some extraordinary images, thanks to co-directors Jacques Perrin and Jacques Cluzaud and cinematographers Luc Drion, Phillipe Ros, and Luciano Tovoli. Early in the film, Brosnan wonders about how we humans can go explore the stars while we have an alien world right here. We then see a rocket take off from the distance, with a marine iguana appearing to look on in puzzlement. We next see what we THINK are stars, but which we discover are sea urchin in a beautiful transition that highlights one of the messages in Oceans: the world of the seas is just as mysterious and amazing as the world of the stars. Another extraordinary scene is the arrival of a battalion of spider crabs at Melbourne (Australia) Bay. When two groups of crabs arrive, the imagery of them colliding as if in war is just as epic as a battle from Gladiator or The Lord of the Rings. Bruno Culais' score adds to the power of the scene, and in fact for all the film. It's comic and light when it needs to be, majestic when necessary, even suspenseful, as when baby sea turtles race to the sea to avoid getting picked off by birds. Near the third act, we shift from the majesty of Poseidon's domain to a message picture. For the most part, humans do not appear in Oceans, as if we do not exist. However, the film makes clear that we ARE involved in the affairs of the deep, and not for the good. We learn that the Great Blue Fin Tuna is in danger of extinction due to over-fishing and vast stretches of nets that capture not only the tuna but other creatures who are discarded when they are brought in. We are shown through space imagery how pollution is reaching out like venomous tentacles (or to my mind, The Angel of Death from the 1956 version of The Ten Commandments) to the waters. One powerful moment is when we see an especially dirty section of water, where a seal is trying to make sense of a shopping cart at the bottom of the ocean. Global warming and the extension of commercial fishing to the Arctic is touched on, and it's clear that Oceans serves a dual purpose: to show us both the power, beauty and majesty of 3/4 of the Earth but also of how we humans may bring an end to the seas. However, Oceans ends with a sense of hope: humans can also be the force that preserves and saves this world. Man and marine life can share the sea, all part of that great Circle of Life. We're left with this question: "Instead of asking, 'what exactly IS the ocean', perhaps we should be asking, 'who exactly are WE?'" Oceans isn't a perfect film: the narration at times can be a bit ponderous and Brosnan's voice at times reflects that. I'm also on a personal level not a big fan of films that lecture me on something, even if I agree with them (and for the record, I share the filmmaker's sympathies on the environment). However, what separates Oceans from something like Food, Inc. is that Oceans isn't what I call an advocacy film. That is when it concludes by telling me what I should do (contact my Representative/Senator, boycott some product, send them money). Instead, Oceans does what a real/good documentary is suppose to do: it presents its case and asks US to reach our own conclusions--and perhaps, motivate us to do something to back up our decisions on the subject at hand. Even if you think global warming is a fraud or that we don't have to worry about some endangered guppy, you can't help be moved by the beauty, power, and majesty of God's Glorious Creation. Seeing the sea overwhelm a lighthouse, seeing a leafy sea dragon which appears as if from another world (which, in a sense, it is) is simply amazing. Oceans will entertain and inform, and while we all may not take steps to preserve/restore the seas, we may come away from it marveling at how awesome is The Deep Blue Sea.